Aquifer Storage and Recovery (ASR) entails diversion of “excess” Carmel River winter flows, as allowed by state and federal resource agencies, which is then treated and transmitted via the California American Water (Cal-Am) distribution system to specially-constructed injection/recovery wells in the Seaside Groundwater Basin. Water is diverted from the Carmel River only when it is plentiful, and is used to recharge the over-pumped Seaside Basin in wet periods. Available storage capacity in the Seaside Basin serves as an underground reservoir for the diverted water. Water is then pumped back out from the Seaside Basin in dry periods to help reduce pumping-related impacts on the Carmel River. This “conjunctive use” more efficiently utilizes local water resources to improve the reliability of the community’s water supply while reducing the environmental impacts to the Carmel River and Seaside Basins. A third phase is envisioned as part of the overall Monterey Peninsula Water Supply Project to be installed in the Fitch Park neighborhood north of Phase 2. This additional phase is designed to accommodate water produced by the proposed desalination facility in off-peak hours, in order to make it available for periods of greater demand. In 1996, the Monterey Peninsula Water Management District (MPWMD or District) began investigating the feasibility of ASR in the local setting. 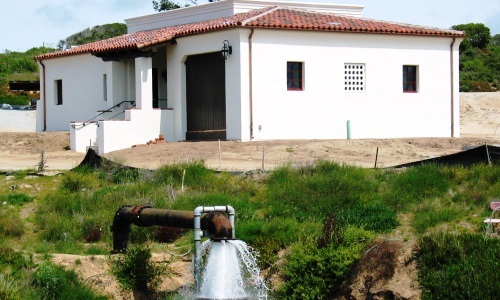 The District constructed a “proof-of-concept” demonstration project in 1997, followed by a pilot test well in 1998 in the shallower aquifer of the Seaside Basin, the Paso Robles aquifer. After several years of successful pilot-well testing, the District acquired property and approvals to construct a full-scale, 700-foot deep test well in 2001 in the deeper aquifer, the Santa Margarita Sandstone aquifer. The subsequent results of extensive water quality and quantity testing were very promising, and led to planning for a permanent ASR project. Based on the success of the feasibility testing program, MPWMD then focused on developing a permanent project at the site of the full-scale test well located east of General Jim Moore Boulevard near Eucalyptus Road on the former Fort Ord Military Base (i.e., the Santa Margarita site). A second full-scale well was completed at this site in 2007, and the District received the needed approvals to transition the site from a testing program to a permanent project in 2008. The Phase 1 ASR Project entails a maximum annual diversion of about 2,400 acre-feet per year (AFY) from the Carmel River, and an average yield of about 920 AFY. MPWMD began to undertake Phase 2 ASR expansion planning in 2008 in cooperation with Cal-Am at a site that is adjacent to the Phase 1 site in the Seaside Basin. The Phase 2 ASR Project also consists of two ASR wells (completed in 2011 and 2013) that are designed to store up to 2,900 AFY of excess Carmel River flows. Water recovered from the Phase 2 site ASR wells will be treated at the Phase 1 ASR treatment facility prior to delivery to Cal-Am system customers. The average yield of the Phase 2 ASR project is estimated at approximately 1,050 AFY of additional water supplies.